This site is dedicated to WDSU AM-FM-TV and the men and women who built and staffed the station facilities and made it one of the finest broadcasting facilities in the country. On the site, you'll find many pictures of the early days of WDSU radio and WDSU-TV. While there are many pictures of early personnel, not all of the early staffer's pictures have been acquired. A continuing effort to get those pictures is one of the aims of this site. An attempt will also be made to identify all those shown in the pictures presented in ths site. Many of the pictures included in the site are from the personal collection of WDSU-TV Producer/Director Paul Yacich. Yacich began his association with WDSU in 1947 as an engineer with WDSU radio when the station's radio studios were in the Monteleone Hotel. As an engineer, he helped to build the new TV facility in 1948 and later became a member of the production department as Producer/Director. Yacich will share many pictures, stories, and memories of the early days of WDSU-AM-FM-TV. 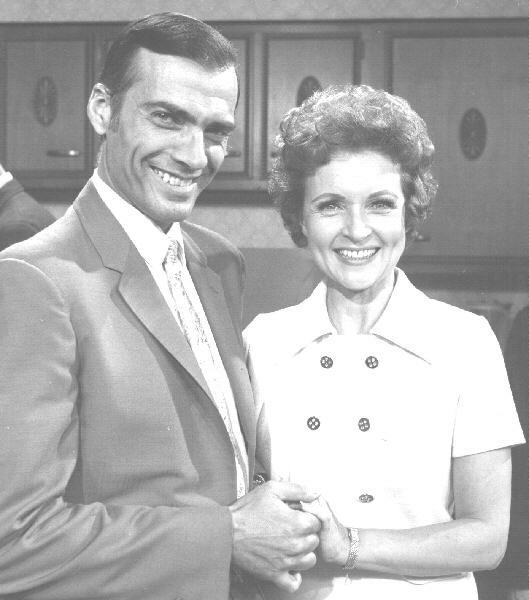 Director Yacich is shown below with television star Betty White, who has been featured in many network TV programs (Golden Girls, Mary Tyler Moore Show, etc.) in New Orleans as they completed several TV commercials directed by Yacich and featuring the delightful and gracious Miss White.